The first half of the year has passed with steady progress in our planning for the biggest KLEFF yet. This also means that the second half of this year is going to be more intensive; the team cannot be busier than we are now (and believe me it will get busier throughout the coming months). But busy is good, it makes us excited and always focused to deliver the best we can. The last day of June was a good day as our festival was covered in the New Straits Time newspaper, thank you NST! We have officially closed our film submissions, thank you to all film makers, producers, directors and distributors who have submitted their film to KLEFF. So that means it is the time to review all films and select the best films, exclusively for our Malaysian audience. I must thank all the esteemed juries for this year apart from myself: Azuan Muda, Al-Jafree Md Yuop and Dr. Nurul Salmi for their support and cooperation as I know we all have to carefully evaluate all the films. One of the latest and important components in KLEFF this year is the Forum Series where we have three forums confirmed in three different themes, which is an amazing achievement for our team to pull this off, with a total of more than 15 esteemed speakers in their own respective expertise. 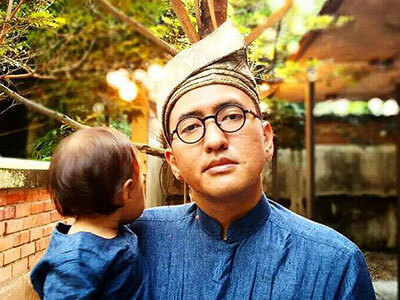 We are also honored to be able to invite a prominent figure in the sustainability community, Mr. Jon Jandai from Pun Pun Academy, Chiang Mai to be one of our main guests in the forum and also a special eco workshop conducted by him at the Festival. For those who may have not heard about Jon, check out his TED Talk which garnered more than 5 million views. Lastly, KLEFF won't be as good or as fun as it is without these two things: performances and volunteers. Therefore we are calling for anyone who wants to be part of this amazing experience to check us out and apply on our website. Thank you and see you in a month's time! We are super excited to be working with United International Pictures to host the KLEFF premiere kick-off screening at TGV One Utama on 23rd August 2017. 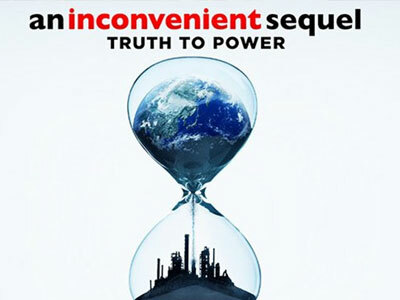 We will be screening the sequel to Al Gore’s “The Inconvenient Truth”, An Inconvenient Sequel: Truth to Power. The film follows the efforts made to tackle climate change and Al Gore's attempts to persuade governmental leaders to invest in renewable energy, culminating in the signing of the Paris Climate Agreement in 2016. Fans and followers will be able to find out how to get tickets to watch this film for free in the cinema by following our Facebook page at www.facebook.com/KualaLumpurEcoFilmFestival. Head there now and LIKE us, and follows our latest updates and announcements there. Meanwhile, check out the trailer at YouTube. KLEFF 2017 Announces Two New Partners! Great news! 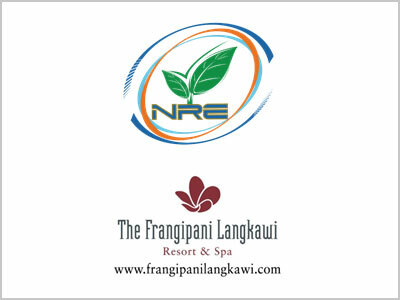 The 10th Kuala Lumpur Eco Film Festival (KLEFF) 2017 committee is proud to announce that we will be collaborating with 2 new partners – Ministry of Natural Resources and Energy (MNRE) and Frangipani Langkawi Resort and Spa. This will be our first time collaborating together throughout the history of KLEFF. If you are curious about MNRE and wish to engage with them, head over to their booth during the festival at the Blue Zone, Publika from 26th till 29th October 2017. Through KLEFF, the MNRE will be promoting one of their latest environmental effort that is the Bill of Access to Biological Resources and Benefit Sharing (ABS Bill) as well as educating our KLEFF visitors on the National Policy on Biological Diversity 2016 – 2025 (DKBK). Have you always wanted to experience a getaway in an ASEAN Green Hotel? We’re excited to let you know that 5 lucky winners will be chosen to receive a prize of 2-night stay in Frangipani Langkawi Resort & Spa which has won the ASEAN Green Hotel Award 2014. Be sure to look out and join the KLEFF-Frangipani Langkawi social media campaign coming to you in October! We would also like to thank Mr. Anthony Wong of Frangipani Langkawi Resort & Spa for hosting our international film makers as well as 2 of our forum panel speakers, Jon Jandai and Pelf Nyok. Meet Jon Jandai in KLEFF 2017! We are pretty sure that the name ‘Jon Jandai’ is no stranger to organic farmers and earthen builders. In fact, we ourselves are stoked to have him as part of the 10th Kuala Lumpur Eco Film Festival (KLEFF) 2017 journey! For those who are not familiar with Jon, he is a farmer from northeastern Thailand who founded the Pun Pun Center of Self Reliance – an organic farm outside Chiang Mai. Besides organic farming, this earthen builder has an interest in seed production, aiming to bring indigenous and rare seeds back into use – one way that contributes to sustainability in crop production. Check out Jon’s ‘Life Is Easy’ talk on TedX DoiSuthep to be impressed by the man himself. Jon Jandai in Efficient Microbe Culturing workshop (28th October @ White Box, Publika). KLEFF2017 is calling for all performers! Are you a performer yourself? Looking for opportunities to showcase your talent such as singing, dancing, busking and performance of all kinds to a bigger crowd? 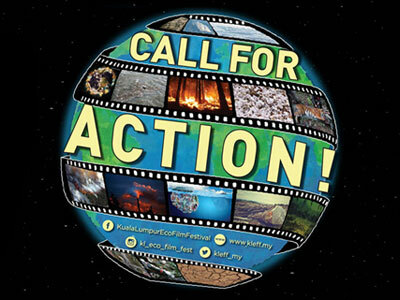 Want to be a part of the first, biggest and longest International Eco Film Festival in Kuala Lumpur? What are you waiting for? Join us in the 2 days of excitement from 28th to 29th October 2017. Use this as a platform to improve yourself and grab the opportunities to show people what you have in store! KLEFF is calling for Volunteers! Are you an environmental enthusiast and wish to learn more to support inspiring sustainable living? Be a volunteer for Kuala Lumpur Eco Film Festival 2017 (KLEFF)! We welcome everyone from different backgrounds and professions to volunteer! If you are a person who enjoys communicating with people, working in a team, up for challenges, willing to learn, and most importantly wanting to contribute something positive, feel free to apply and join us! For more information about being a KLEFF Volunteer, feel free to visit and register at http://kleff.my/call-for-volunteers/! Hope to receive your application soon! 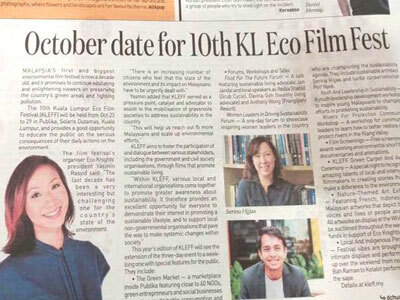 On the 30th June, the 10th edition of the Kuala Lumpur Eco Film Festival (KLEFF) was featured in the News Straits Times where our President, Yasmin Rasyid, discussed the urgency for Malaysians to address the inevitable environmental issues, and how EcoKnights uses the power of film and dialogue to educate and inspire the Malaysians on this crucial matter. The article revealed the Festival’s exciting features that will be happening at our week long celebration this October: Green Market, Workshops, Talks, Forums, Film Screening, KLEFF Green Carpet, Nature Art-Themed Exhibition, and Local and Indigenous Performances. It is a platform for you to get motivated and drive your environmental compass to take charge and do your part for the betterment of our nation. Already feeling excited to get into the green scene? Then mark your calendars from the 23rd to the 29th October at Publika for a week’s worth of environmental awareness and inspiration through films, performances, food and sales of green products. Check Out What Our Previous Intern and Volunteer, Jae Mie Has To Say about KLEFF!! I was in charge of the photography team at the 9th Kuala Lumpur Eco Film Festival along with our very own graphic designer, Jijuy. We stationed our volunteer photographers at various sections of the festival and captured quite a number of photographs ourselves. The environment at the KLEFF was amazing, and even the word amazing is quite an understatement. It’s a Festival where different people from all walks of life come together for one purpose – to make the world a better place, to work towards leading a healthier and greener lifestyle for themselves as well as the generations to come. The number of festival-goers significantly grows year after year and we are hoping that it continues to do so. It proves that more people are aware of the changes happening and are willing to take a step further to protect Mother Nature and it is indeed an incredibly positive drive. Being around so many people with the same purpose will only push and inspire us to do more for the world we live in. My experience at the KLEFF has definitely been an unforgettable one. I have learned so much while working with the team and they were like family to me. I felt genuinely happy because not only was I working with them, but I was contributing to the society as well. I was helping to raise awareness among others and it is a wonderful feeling to be able to see how many people are actually willing to make a change. When you volunteer at festivals such as this, you inspire and are inspired. I learned a ton of green habits like how to make Eco Enzyme, how to properly carry out composting at home, and other ways to lead a simple but impactful eco-friendly lifestyle. But most importantly, I learned about teamwork and courage. No one is able to work alone at festivals like this. All of us had this kind of connection and understanding among ourselves which made all the hard work and late night preparations bearable. Sure, there has been tons of stress handling and getting ready for the Festival, but working with people who turn that stress into positive energy with zero complaints really doesn’t make it seem like work at all. Why I mentioned courage earlier is because we get pushed out of our comfort zones, to do things we never thought we could do. We work as a team, but it’s also a space for us to grow as individuals. It’s where we’re able to take risks, to overcome our fears. The best part is that we are given the benefit of the doubt by Yasmin and Fadly, our president and Festival director, to be able to carry out those tasks. That trust in itself is fuel for us to move forward and conquer the fear we have. We all come out of it a different person, discovering the potential we didn’t know we had in the first place. 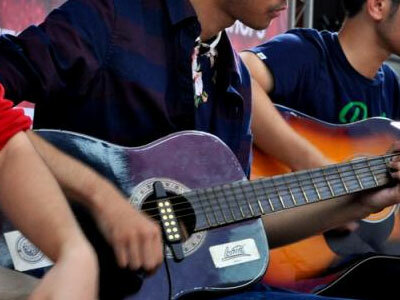 The KLEFF is a Festival like no other and educates its audiences through entertainment. Films screened during the Festival would open your eyes to issues that most people didn’t even know existed. Since we receive films from all around the world, people would feel so small once they have seen what’s beyond the borders, and perspectives change because of that. Films deliver the message and captivate the audience in a way that is much more effective than reading, especially youths who would much prefer watching films – and they are the ones who would shape our future. There will also be awesome performances during the KLEFF by our local artists and you’ll find out how good local music can be. Eco-friendly booths will definitely be set up, and that goes without saying. Find out how you can do your part in shaping a greener future by visiting the booths during the Festival. A small step is still one that can create a ripple effect. It’s a platform for people of different opinions and perspectives to come together, share their thoughts and ideas, watch amazing films and talents, and visit booths which will push you further to being a greener individual. On top of it all, we learn and we are inspired. We hope that you can inspire others to do the same. Now in its 10th year, the Kuala Lumpur Eco Film Festival, produced by environmental NGO, EcoKnights features environment-themed documentary, feature, animated, archival, and experimental and children's films from around the world. KLEFF showcases ground breaking films, traversing the relationship between humans and their environments, challenging the way people think about the natural world and inspiring them to discuss, explore and act on important environmental issues. The films will be shown at various venues around Kuala Lumpur, including art spaces, cafes, universities, high schools, corporate officers and community theatres. Filmmakers and special guests will discuss their work at the festival. Most screenings are free to the public and include discussion with filmmakers or scientists on emerging environmental concerns and issues. The Festival's signature programs include the Green Market, Film Making Workshops, the KLEFF Awards Night, Green Vibes and more. The Festival hosts a number of juried cash awards, as well as audience awards. The KLEFF's official host venue is Publika Solaris. More information can be found at www.kleff.my. EcoKnights® is a non-profit environmental organization that champions sustainable living and supports a community of film makers, and environmentalist who embody diversity, innovation and uniqueness of vision. EcoKnights' Board of Committee Members, staff and constituents is comprised of an inclusive community of individuals across ability, age, ethnicity, gender, race and sexual orientation. EcoKnights serves the community through development-led interventions from education and awareness programs to research; and public participation programs to consultation. EK's partners range from government agencies and communities to corporate agencies and NGOs. For more information about EcoKnights, log on to www.ecoknights.org.my. Fadly Bakhtiar, Festival Director, fadly@ecoknights.org.my, +6017 227 9270. To ensure you get our latest news, add kleff@ek-newsletter.com to your address book. 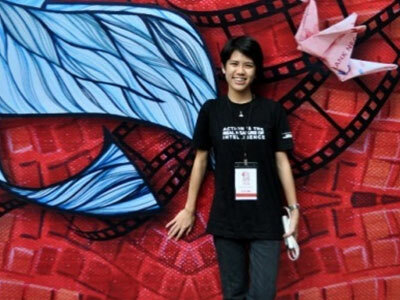 The Kuala Lumpur Eco Film Festival (KLEFF) is organized by EcoKnights, a non-for-profit environmental organization registered with the Registrar of Societies Malaysia. EcoKnights' core focus areas are in environmental education and awareness using innovative and creative platforms such as the KLEFF. More information about EcoKnights can be obtained from www.ecoknights.org.my.